For other detailed maps showing the ethnolinguistical distribution in Benin & Togo see this page (scroll down). Source: “Beyond the Middle Passage: Slave Migration from the Caribbean to North America, 1619-1807”, : (G. O’Malley, 2009), The William and Mary Quarterly, 66, (1), 125-172. 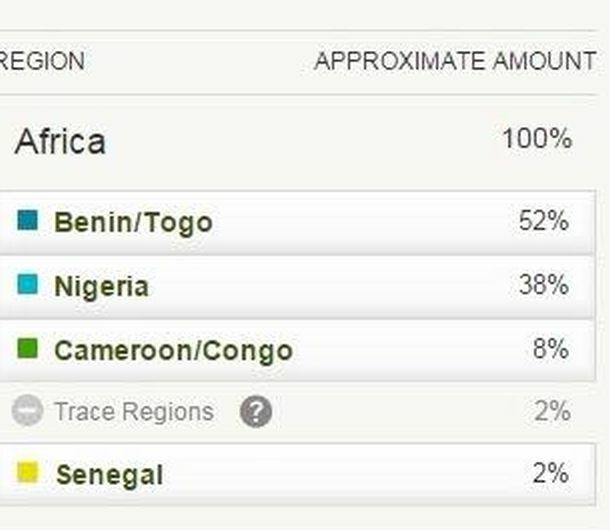 One of the most surprising outcomes of my survey of AncestryDNA results across the Afro-Diaspora has been the higher than expected average scores for “Benin/Togo” seen for African Americans and also Anglo-Caribbeans, especially Jamaicans. It is surprising because even given individual variation and many possibilities of “real” Beninese ancestry to some (minor) degree, documented Trans Atlantic slave trade data does not seem to support such a consistently high average level of “Benin/Togo” for the Anglo-Caribbean and even less so for the USA. 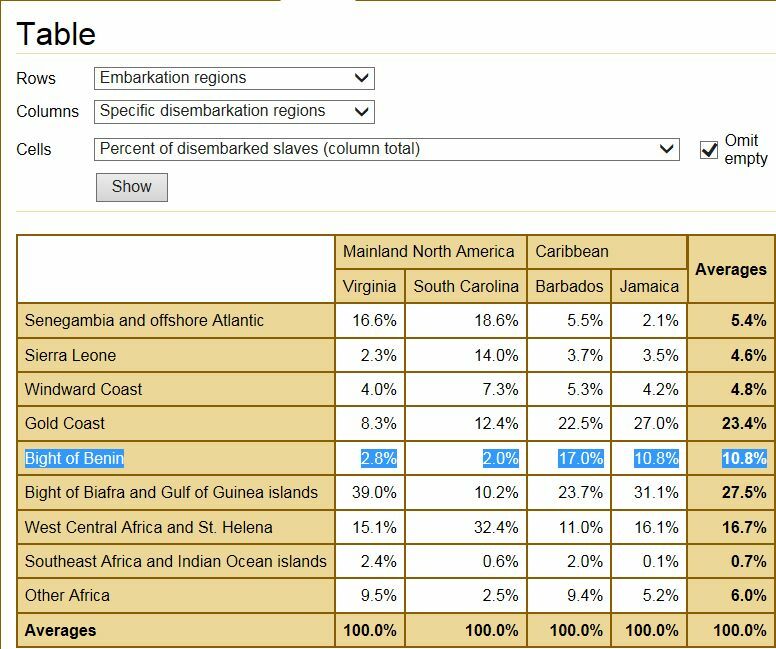 We can see this clearly in the second chart above generated from the Slave Voyages Database. If we compare the percentages of the Bight of Benin with the calculated shares of total African for “Benin/Togo” according to AncestryDNA there are major discrepancies especially for Jamaica and the USA (Louisiana being a notable exception but not really representative for the rest of the States). It’s intriguing to think about what might possibly be causing this outcome. The following three scenario’s i will mention can perhaps provide partial explanations for the unexpectedly high “Benin/Togo” percentages being reported but as a fair warning in advance they are also speculative! The slave voyage data from Barbados indicates that especially in earlier timeperiods (1600’s and early 1700’s) there was indeed a significant inflow of captives from Benin arriving in the West Indies. And possibly by way of Inter-Colonial Slave Trade these captives were also partially brought over to Jamaica when its plantation economy was being set up in the late 1600’s as well as to the US. 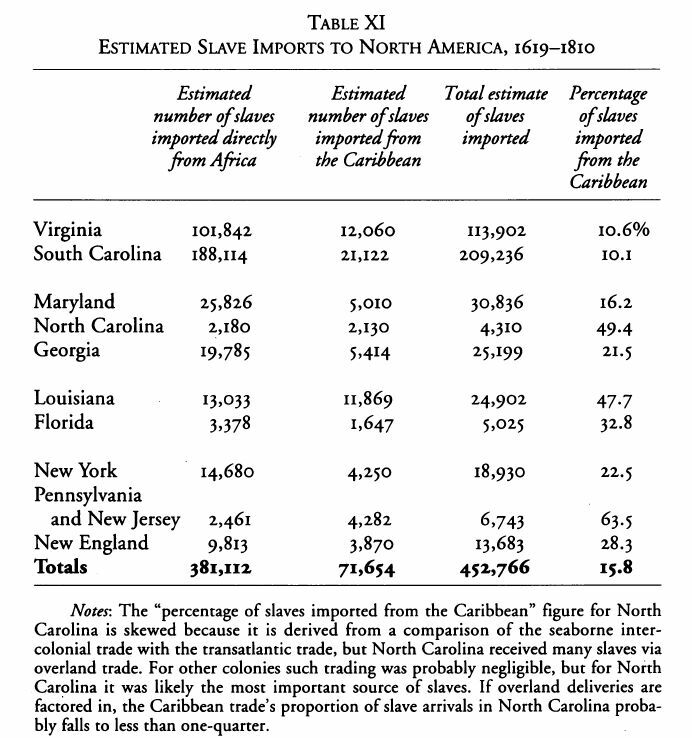 According to a latest study (O’Malley, 2014) this Inter-Colonial Slave Trade route would amount to about 15% of overall slave importations for the Thirteen Colonies, being more pronounced for some states than others (see last chart). Even inspite of the prevailing brutal living conditions in the Caribbean – causing negative reproduction rates in general – it might possibly be that cumulative founder effects were set in motion by those people who did manage to survive the ordeal and passed on their genes to the first generations of locally born slaves in the Caribbean as well as to some degree in the USA. So it would seem in this case the inherited “Benin/Togo” markers could be signalling genuine Beninese ancestry, especially from the Fon and other Gbe speaking groups who would have had a relatively larger presence during these earlier timeperiods. Another undocumented source of genuine Beninese origins i can think of is that despite being shipped away from the socalled “Gold Coast” (and also counted as such in the slave trade data above) a higher than expected number of these captives (often just assumed to be Akan speakers) might actually originally have been from the Benin/Togo area. Which is to say that the proportion of Gbe speaking people among Gold Coast captives might have been underestimated. Only ending up in the European slave ports along the Gold Coast instead of the Bight of Benin because of coastal shipping or overland routes. A third possibility being that the illegal slave trade taking place after 1807/1808 and also involving the Bight of Benin (e.g. the Clotilde voyage in 1859) was greater than imagined sofar. However given the very low reported rate of African born slaves in the USA throughout the 1800’s and the documented early creolization of American slaves in general this option seems least likely to offer an overall explanation for the high averages of reported “Benin/Togo”, although in selected individual cases it could very well be. Genetic overlap with other regions? Given the fact that AncestryDNA tested Africans themselves also show regionally mixed testresults (usually only neighbouring and overlapping regions, see also this page) it is wise to be careful in drawing premature conclusions and also consider other ancestral options. In the screenshots above we can see that prudence is also called for by Ancestry.com itself. Especially the apparent existence of Ghanaian reference panel candidates scoring over 90% “Benin/Togo” gives food for thought. Ancestry.com was careful to remove this single sample for good reasons however it’s a very clear indication of the overlap between Ghanaian and Beninese samples utilized by AncestryDNA as can be seen in the first screenshot above. In this very insightful plot it is shown that the “Benin/Togo” and “Ivory Coast/Ghana” regions cluster the closest from all other African regions on AncestryDNA. And furthermore the samples from Benin/Togo and Ghana/Ivory Coast are the only ones that seem to overlap to some degree. Suggesting that they’re genetically very close indeed and there might be some incorrect assignment between the two as it would be impossible to make any distinction in some cases. There are several possible reasons why this should be so (see also more detailed discussion on the AncestryDNA Regions page). But it’s probably mostly due to widespread ancient shared ancestry across Ghana, Togo and Benin, extending into southern Nigeria a putative home land of many Kwa/Gbe speaking groups, as well as being correlated with ethnic background in Ghana. 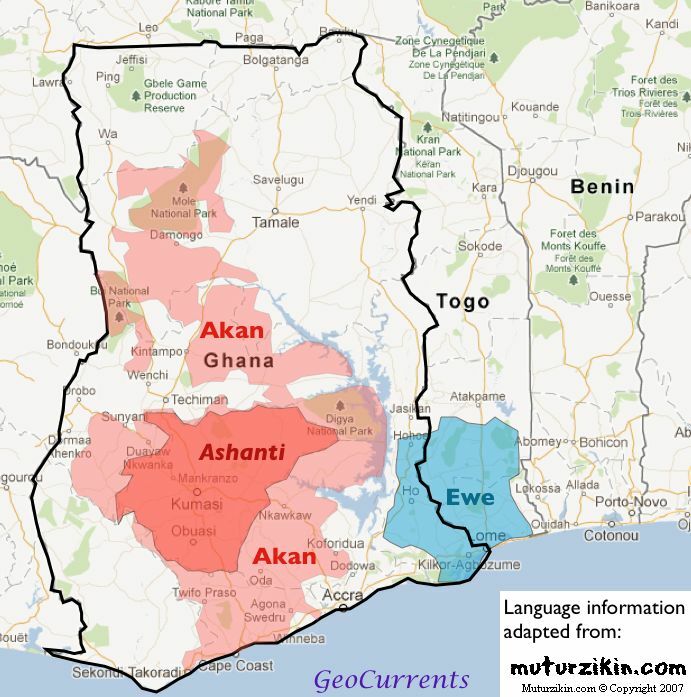 Especially the non-Akan groups (more than half of the total population of Ghana) and particularly the Ewe (who also live in Togo and are Gbe speakers just like many ethnic groups from Benin) possibly possessing a higher degree of “Benin/Togo” markers. Counterintuitive perhaps at first but still very insightful if you are aware of the relevant context. As can be verified from the one single AncestryDNA result i have obtained sofar for a quite likely Ewe person below. However i suppose due to widespread ethnic intermarriage “Benin/Togo” DNA markers could probably also show up for Akan speakers themselves. Again the country name labeling of the AncestryDNA regions should therefore not be taken at face value. 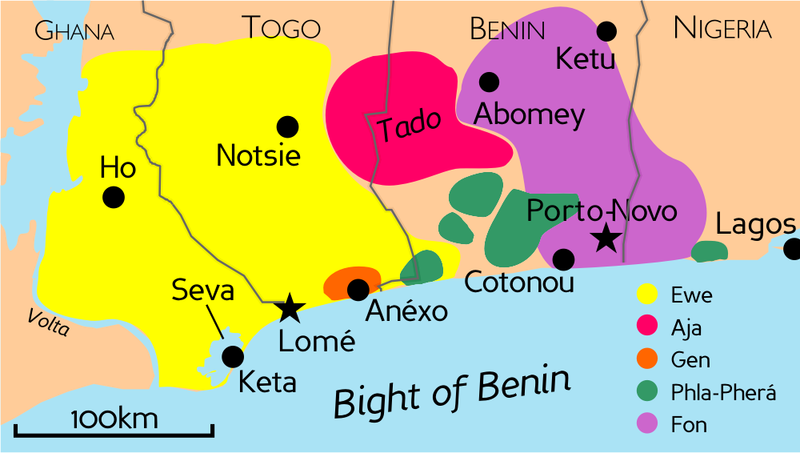 “Benin/Togo” might signify different and wideranging ethnical roots also outside of Benin’s borders depending on your own nationality. For Haitians (whose results do show the highest average score among Afro-Diasporeans for this region as expected, see very first chart above) and Brazilians this category is indeed very likely to be derived from the Fon, Adja or Yoruba. Given their confirmed and well documented ancestral/cultural connections to Benin and Yorubaland. For African Americans and Anglo-Caribbeans “Benin/Togo” is perhaps more likely indicative of Ewe or other types of non-Akan ancestry from Ghana/Togo. Additionally also Nigerians (even Igbo’s!) might have carried over some ancient “Benin/Togo” component into the genepool of African Americans, Jamaicans & other Anglo-Caribbeans. 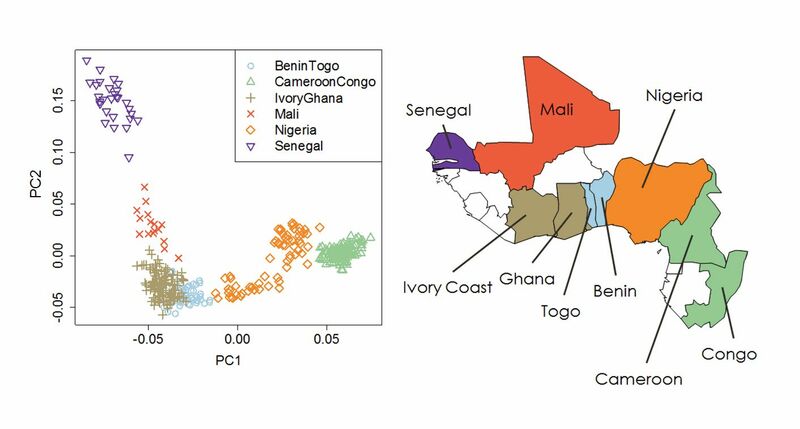 Even more so than for Ghanaians showing “Benin/Togo” markers in their genome the “Benin/Togo” labeling is misleading for Nigerians as it misrepresents the most likely east to west direction of geneflow for these DNA markers. It is perhaps best to consider this a component “X”, originating within Nigeria but nowadays seen most frequently (but not exclusively!) among people from Benin/Togo because of ancient migrations, shared origins and founding effects. We can verify this by reviewing the two AncestryDNA results shown below for persons of confirmed fully Igbo and Yoruba ancestry. As expected because of geographical proximity the Yoruba person shows a greater degree of “Benin/Togo” than the Igbo person, but for both it is very substantial. They are of course only individual results (see the very first chart for a group average calculated by myself and this graph for the samples used by Ancestry.com) but in theory any Yoruba or Igbo ancestor having a similar genetic profile could have passed on “Benin/Togo” markers to their American-born descendants. For Jamaicans the Yoruba option is likely to be more relevant than it is for African Americans because of the additional arrival of socalled “Nago” contract labourers after the Abolition of slavery. But for both i suppose at least a minor degree of socalled “Benin/Togo” could very well also have found its way in their AncestryDNA results by way of Igbo or Biafran ancestry. Each case to be judged on its own merits naturally and depending also on any possible additional clues. All things being the same i suppose for people with “Benin/Togo” reported as number 1 main region a Biafran explanation might be least likely and other more plausible scenario’s should be explored. However each of the above described ethnic options or also a combination to any degree could still be possible in individual cases 😉 Right now there’s just no way of making the distinction. Perhaps with an upcoming update there will be more clarity. But even so a perfect measure of “genuine” Beninese ancestry might never truly be possible due to artificial manmade borders and a high degree of genetic similarity between neighbouring ethnic groups. In the end all of these ancestral clusters and regions are afterall constructs much like the very concept of “ethnicity” itself. I learned so much from this post – very insightful! I just wanted to point out too that I manage Nigerian kits (1 Igbo, 2 Yoruba & 1 Efik) via AncestryDNA and Benin/Togo is the top regional cluster. among two of them, I also think that a sizable degree of Benin/Togo appearing among African Americans is connected to Ewe genetics, though not the only of course. I think it would be great if we (if you haven’t already started) create a catalog of ethnic groups that map to AncestryDNA’s regional clusters. It could very likely help to predict better ancestry regional affiliations more precisely (semi-precisely). For example, we know that southern Nigerians (East-West) almost certainly map to the Nigeria and Benin/Togo regional clusters. As well we know that Fula and Cape Verdeans map to Senegal and Mali. What if we build a large ethnic-regional cluster mapping directory? It’s something to consider, right? All the regional affiliations you have pointed out can be seen already, albeit based on minimal sample size for the most part. I have for example 3 Ewe results which contrast greatly with the 6 Akan samples from Ghana. Yes, yes, VERY GOOD. I’ve had 25 family members tested and between all of us we have 20 100% African genome matches, including some from Liberia, Togo, and Delta States. I can send them to add to your list if you’d like. This was so insightful! Is there somewhere I can contact you? Hi Whitney, thanks for your comment! What would you like to contact me about? I am jamaican and took the ancestry DNA Test. I am a descendent of Mooretown, the Maroon community in Portland, easter Jamaica near Port antonio. I know that my great great grandmother/grandfather spoke Twi or a version of it. Yet when I did my test, i was found to have only 10% ghana/ivory coast and 40% benin/togo. I have met many Ghanaians in American and they have ALL told me that I look like them! I have also met people from Bein/Togo, and I have never been told that I have any resembles to them. One person have told me that the Haitian people in New York City resembles them. I have looked at pictures of both sets of people, and generally I see no resembles between us Jamaicans and people from Benin/Togo, but its quite obvious as a Jamaican that we resemble the people from Ghana. I know that looks is not all to determining genetic relationships, but i sense that ancestry.com is completely off withs assignment of DNA to people of Ghana-Ivory/Benin-Togo. They seem to have a hard time distinguishing the two, and this may be the only reason for the discrepancies listed above! Hello, I am Barbadian and I see that Barbados is featured prominently along with Jamaica in your charts. My son, who is mixed race (his father is Mexican) did his DNA and he came back with ancestry from Benin/Togo (from my side). Growing up in Barbados, I was told we are descended from the Igbo. Our local dialect has Akan and Igbo words. Can you provide any more info on Bajan ancestry? Could you describe the features taht make Jamaicans resemble Ghanaians and not people Benin/Togo? For xample, facial features? Agreed! I too am a Maroon Descendant and Ive visited Ghana and I saw many that I featured or featured me. Also in Ashanti Region they told me I was their relative and spoke to me in the Ashanti twi language but did not understand. On ancestry and 23 and me Ive about 5 ghanian relatives, 5 igbo, and about 3 yoruba relatives. so Definately within the connectiving regions. I have a high cameroon/congo, next in line is the benin/togo. 5% ghana, 5% nigeria however, the cameroon congo/ can include the igbo, the efik, ibibio tribes of nigeria, benin togo can be also be the yoruba which is large, they come from a large kingdom the oyo empire. After reading a lot of information about Nigeria and Ghana’s relationship to the markers of Benin/Togo. I have virtually none of Ghana or Nigeria DNA What do you make of this? 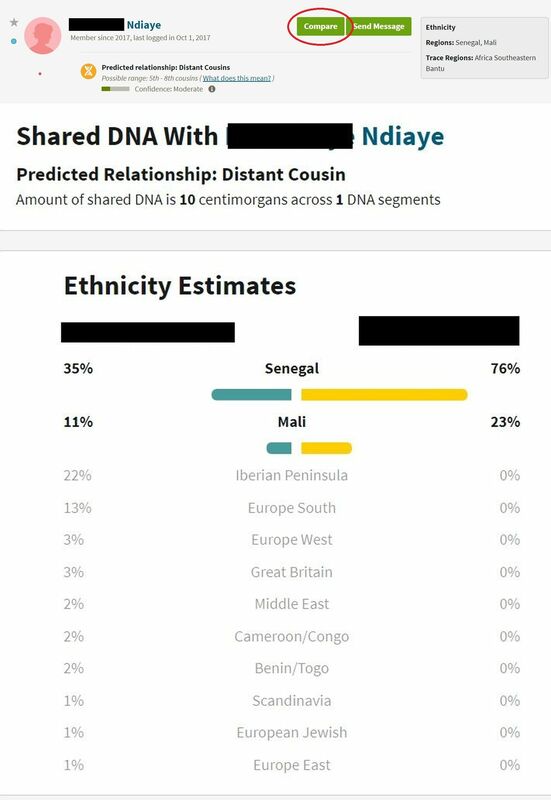 Does this mean I have genuine Benin/Togo DNA? How can I have such a high Benin/Togo and no Nigeria or Ghana. Total let down I have not an ounce of Ghana and even less Nigeria. I’m shocked I’m even 92% African. I’m just too thrilled‼️But confused. Hi Felicia, the odds of “Benin/Togo” being genuine are determined first of all by your background i would say. You would have to study the documented ethnic/regional origins of enslaved Africans being brought to the states where your earliest known African American ancestors were from. However from what i’ve read there’s very few places where genuine Benin lineage (Fon/Gbe) would ever have been truly predominant in the USA (they were present in significant numbers in several states though). To be frank i think for a greater majority of African Americans “Benin/Togo” will rather suggest Ewe lineage from eastern Ghana or southern Nigerian lineage. Or also a combination of both and in some cases also some genuine connection to Benin and/or Togo thrown in the mix as well. In your case 46% of your DNA could very well trace back to several dozens of individual ancestors who were born in West Africa and relocated to the Americas. You can almost be certain they would not have been from just one place or just one ethnic group. Although in all likelyhood still closely interrelated and geographically nearby. Hi Felicia, I understand your frustration but I don’t think you should be worried or confused. Having Benin/Togo is not a bad thing. I am Ewe from Ghana. We have Ewe tribe spanning from southeastern Ghana to Togo. I think labeling the DNA result with the country name is a bit confusing since the name Ghana, Togo, Benin, Nigeria, etc. were not in existence when slavery took place. All these names came into the picture in the late 50s. Ewes in Ghana and Togo used to be in the same location until the Europeans came to draw boundaries and divided the Ewe tribe into Ghana and Togo. Same with Benin and Nigeria. You have Yorubas in Benin and Nigerian. I don’t think ancestry should be determined using those country names. I am a Ghanaian Ewe but still have families in Togo. Being a Ghanaian Ewe or Togo Ewe doesn’t make any difference. We are the same people. Should I go for the test, I’m likely to have high Togo/Benin though I am a Ghanaian Ewe. The land(Volta Region/Trans-volta Togoland) currently occupied by the Ewes in Ghana originally was part of the present day Togo. Any Ghanaian Ewe will have Togo/Benin when s(he) should take the test because we used to be part of present-day Togo. Yes, I’d argue for you taking the test, if not for yourself for those of us in the diaspora. The more samples Ancestry has to work with, the better for eventually drawing better regions. For someone like myself, I’ve been able to find Ewe Ghanian heritage. BTW, while the names may initially be confusing, one simply has to do more research from there, which isn’t asking much. All regions will need some kind of name. Ancestry does make clear in its descriptions of its regions where this “group” can also be found. So, for instance, on the “Benin/Togo” region, Ancestry clearly lists in its “also found in” description that this genetic grouping is also found in Ghana, Nigeria, and Mali. Not only that, but Fonte’s literally starts off the post with the “also found in” description and with Benin/Togo in quotations is also the implication that this is just a region name, not something to be taken literally. FonteFelipe – think this analysis is fascinating. I’m African American and found that I have 22% out of 66% African from Benin/Togo as well as 14% Nigeria, 13% Cameroon Congo and 6% Ivory Coast/Ghana. I read your hypothesis on the Benin/Togo markers coming from the Ewe people and found an article about the Ewe’s in Ghana with a picture of tribal elders at a festival and one of them looked nearly identical to my maternal grandfather and his son my maternal uncle. The resemblance was more than striking, I’d love to share the pictures with you at some point. Based on that I’m fairly well convinced that I’m descended from the Ewe and despite Ghana being a lower percentage according to Ancestry. I’d be interested in your thoughts…I’ll follow the steps to share my results for your insight. Hi Chris thanks a lot for your comment! Finding resemblances with actual African persons is always fascinating. It’s something that i’ve been intrigued by for a long time actually. And i do think something is to be learnt from it. But more so going by generalized trends and not so much on a person to person basis as the individual variation among Africans themselves will be too great. As they say phenotype does not always follow genotype (although it usually is correlated even when not perfectly so). And from that perspective appearances can indeed just be skindeep and even misleading. You might still indeed have Ewe lineage however i like to underline that socalled “Benin/Togo” is not an exclusive marker for any given ethnic group. It could be suggestive of many different ethnic origins from eastern Ghana into southern Nigeria, while possibly also some ethnic groups further west such as the Gur speaking people in Burkina Faso and northern Ivory Coast might score substantial amounts for this region as well. I intend to do an update on this page eventually based on enhanced insights from my ongoing survey. I had a look at your DNA matches and i filtered out the quite likely African ones according to my tutorial (see this link). The outcome was very interesting and somewhat surprising. I would like to stress that these matches should be interpreted carefully. While providing very valuable insights and more detailed specifics on your African roots. They are at the same time only informative of single family lines and not your entire DNA or ancestry. The odds of being matched are also dependent on the number and specific origins of DNA tested Africans within Ancestry’s customer database. Having said all that i managed to single out atleast 12 African matches for you ( i will send the details by PM). I am not entirely sure of their background but their names are usually quite indicative. One of them is most likely from Ghana, not sure if Ewe. Another one is possibly from Nigeria. Two matches are quite likely from either Central or East AFrica. But the greatest number of your AFrican matches seem to be from the Upper Guinea region, that is Senegambia, Sierra Leone/Guinea and Mali! From what i’ve seen sofar this pattern is quite exceptional for African Americans. They do regularly have Upper Guinean matches but compared to their Nigerian or Ghanaian matches the number is almost always fewer. But in your case (sofar 😉 ) it’s the other way around. Even when combined your “Senegal” and “Mali” scores are only 6% out of 66%. Naturally as more and more Africans will do the AncestryDNA test you might eventually also receive more Ghanaian and Nigerian matches. Still a very useful outcome as it illustrates how proportionally speaking your individual DNA matches will not always correspond with your entire autosomal DNA makeup. Hi Chris, I’m Ewe from Ghana. Ewes in Ghana were not originally part of Ghana. We used to be part of the present day Togo. Though I’m a Ghanaian Ewe now, my result is likely to be high for Togo/Benin should I take the test. I don’t think any Ghana Ewe will have high % for Ghana in their result since we weren’t originally part of Ghana until the 1950s. It was the Europeans who came to draw the boundaries to divide the Ewe tribe between Ghana and Togo. To have a high % for Ghana in your result may means you have an Akan ancestry. HI John-Paul, thanks a lot for commenting on my blog! I agree that it’s very likely that Ewe from Ghana will receive high “Benin/Togo” scores. Although in some cases of people with perhaps mixed origins (1 parent or 1 grandparent or 1 great grandparent) the “Ivory Coast/Ghana” scores may get substantial still. See page below for a few Ewe results: the “Benin/Togo” amount for them were 97%-72%-46%. Thank you for this article, I came across your website in seeking more information to help me gain more understanding in my DNA makeup. I’m African American, and African results from Ancestry are below. The explanation about Benin/Togo DNA is great. I’ll be reading through this website for more insight. This was very an awesome read! Iv’e done Ancestry and National Geographic Genome project. I want to do the African Ancestry to hopefully give me more information. My DNA is ALL OVER the place literally! I live in Texas close to the the Louisiana boarder so i’m in that group of African American (Louisiana Creoles). and the rest in Great Britain, Scandinavia, Europe West, Iberian Peninsula, European Jewish, Caucasus, Asia Central, Ireland/Scotland/Wales, Finland/NW Russia, and Native American. My husband is Yoruba so I cant wait for him to take the test. Also I found a discrepancy. When I did the National Geographic GENO 2.0 it showed 5% East African. They do not pin point countries but regions and none of the countries in that region showed on my Ancestry.com. They do i think claim to go back further in the DNA, so I’m unsure if that has something to do with it. I have no personal experience with National Geographic. But generally speaking i believe that the socalled “East African” label when used in DNA testing should always be critically scrutinized. I am usually very sceptical about the socalled East African scores reported for African Americans and other Afro-Diasporans from the Americas. Because it does not fit well with historical plausibility nor cultural retention. If not some fluke in their algorithm or artefact of their reference populations, indeed it most likely represents VERY ancient population migrations across the continent (going back millennia instead of centuries). Something which would also be detected among actual West Africans. Irrelevant therefore from a genealogical perspective (last 500 years or so). What a great blog. Please help me take the next steps on finding any of my 3rd 4th or 5th cousins from Africa. I am African American with my highest ancestry dna score coming from Benin/Togo. What other test or websites do you recommend for me to find actual connections to tribes or currently living people in West Africa? Thanks for your comment Taylor! Please see my reply to a previous comment by Adrienne on january 7th above. Hi Taylor, I am Ewe from Ghana. Togo/Benin in your result could mean you have Ewe Ancestry. Ewes in Ghana used to be part of the present day Togo. Ghana Ewes and Togo Ewes are the same people. Hi do igbos constitute a very high degree of the african american gene pool? This website is a godsend! Thank you for all of your hard work. I have tested myself, my mother , my father, my paternal grandfather and my paternal grandmother. I have seen surprising differences in the test which has only pushed me towards more questions. If you are looking for more results to use in your research let me know. So I was told that my Nan’s great grandfather was Jamaican, he married a Caucasian English lady in England. They had my Nan’s -grandad and his brothers and sisters. According to my Nan’s brother he used to visit the great aunts and uncles, some of which were from the west-indies. So I’m assuming they married West Indians. So reading this post which is awesome by the way, now explains the fact that my DNA says 2% Benin/Togo and my 4x grt grandfather probably was Jamaican. Sweet! Hello ML, thanks so much for the heartwarming feedback! Really glad to know you think my blog is useful! I am no longer adding results for my survey. Because most likely an update will be carried out by Ancestry. Which will probably change everyone’s breakdown. At times also drastically so judging from the few updated results I have seen already. Igbo and AKan lineage is indeed very likely for many Barbadians but in addition they will also have African roots from other places and other peoples. Similar to other West Indians and other parts of the Afro-Diaspora who will almost always be a composite of multiple ancestors hailing mostly from Western, Central and to a minor degree also Southeast Africa. I do not yet have much detailed info on Barbados, however by comparing with sources for other parts of the West Indies you will get a good idea of the ethnic possibilities already. I am 99% Caucasian and 1% Benin/Togo. That tells me my African ancestor is five generations,plus or minus, back. I hired Ancestry to see if the could find my African ancestor. No luck. They said this could be a remnant of a much more distant ancestor. Please email me if you need to look at any other results. I am able to trace my family back decades before civil war. With there being no migration from where the ancestors landed in South Carolina, North Carolina , Mississippi and Virginia. It looks based on family lore that our ancestors were here since far before the revolutionary war. Thanks for the offer Tierra! I have actually discontinued my AncestryDNA research for now because of the recent update (see this link). Hello FonteFelipe. Happy holidays. I just shared my result with you on AncestryDNA. I’m a confirmed Nigerian from the South West (Yoruba from Ogun State) but my result shows 86% Benin/Togo and only 6% Nigeria! I am very confused and sad about this. What do you make of this? Thanks for for great work on this site. It is much appreciated. Hi, thanks a lot for sharing your results with me! Much appreciated! This outcome has actually been very common for southern Nigerians. Minimal “Nigeria” and a predominant “Benin/Togo” score. The first thing to keep in mind is that the country name labeling is not to be taken to literally. If you check the regional maps you will learn that socalled ‘Benin/Togo” is actually describing DNA from many surrounding countries as well. So it is not meant to be seen as anything exclusive or exact. Given the close proximity between Benin and Nigeria , as well as the fact that Yoruba are also living within Benin this outcome is not really that outlandish. Ancestry used to do a much better job at predicting Nigerian DNA. Your results are however reflecting the updated version (current since September 2018). Based on the before & after results of 130 African DNA testers from across the continent I think this update will NOT be an improvement in regards to the African breakdown. Instead regrettably it might lead to less insight into the African regional roots of Afro-descendants and actual Africans. In the last past years I did find that regionally speaking the previous version of AncestryDNA was reasonably in line with either historical plausibility or actual verifiable genealogy. Despite several shortcomings as well as the continued need for correct interpretation. I went back to look at this post because I have been perusing my DNA matches. I never had high Benin Togo scores, but most of my matches have higher percentages than I do (with the update). Mine went from 11% to 5%. My Cameroon Congo/Southeastern Bantu percentage went way up, from 3% to 23%! I wonder how can we best utilize information from our DNA matches? I was thinking if there was some way to connect the degree of a DNA match and the information from those matches in some way that reveals more about our own ethnicity, even if only on a single region and in spite of borders being created that may have nothing to do with actual ethnic groups. Ideally I suppose Ancestry should provide a chromosome browser and also inform its customers of the ethnicity associated with shared segments. However the current compare tool also can be quite useful already to at least have an overview of shared regions. These might be more than one, but could already help you to at least rule out others. I’d bet that like me, you’re African is really mostly Nigerian in origin, and the two regions are measuring that. Most of my African matches turnout to be Nigerian despite me having no Nigerian percentage. Your Cameroon, Congo, and Southernern Bantu is likely measuring some Nigerian groups. I’ve found this true with a lot of my matches, too. Ancestry has to get WAY better with their west and southern African regions in particular. That said, I’ve had quite a few matches with Bantu people, too. And that’s the unfortunate part of this revision. There is not enough differentiation being made between Bantu peoples, who originated along the Nigerian/Cameroon border and Nigerian ethnic groups to the west of that dividing line. The Bantu began their expansion from this border region over 3,000 years ago. If they can differentiate between the English and the Irish, for instance, Ancestry should be able to differentiate between these people and Nigerians must better than they have. I believe the borders that exist now were non-existent back then. Our people migrated and moved and our genes combined. I read above where people say they don’t look like the people of the region and so forth. How can someone tell where they are from and who they’re related to based on looks? I’m glad I know where my ancestors originated. I now look forward to visiting in the near future. Keep up the great research!